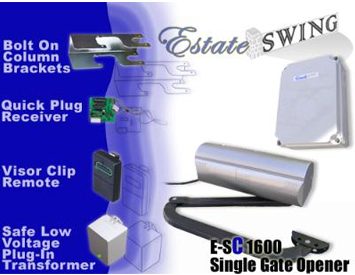 Estate Swing is a leading distributor of gate opener products with innovative developments. Often, we are the first to offer these incredible products in the US. Gate openers that have the appropriate torque for a Vinyl Gate: Vinyl gates are much more fragile than metal gates; this is the one case there the larger motors with more leverage actually work against the ideal operation of the driveway gate. Many times, these higher powered automatic gate openers can actually cause damage to the gate. In recognizing the special needs of customers with vinyl gates, we present the 1100 Swing series and 1200 Slide series, which are gentle enough to handle the structure of a vinyl gate. Gate openers that accommodate the set back for opening column mounted gates 90 degrees or more: Gates that are mounted to concrete or brick columns present a greater challenge for mounting a gate opener. 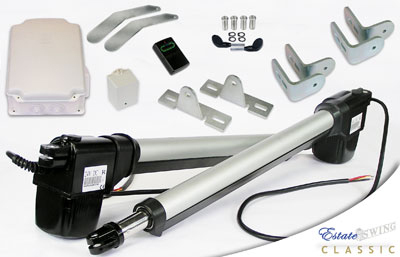 Most gate openers, ones that are linear actuators, cannot work because they have to be mounted on the back face of the column, which prevents the linear arm from fully extending. The farther the hinge of the gate is from the rear pivot point of the gate opener, the more restricted the movement of the gate opener is, often restricting the driveway gate to opening no more than 60% of its full capacity. 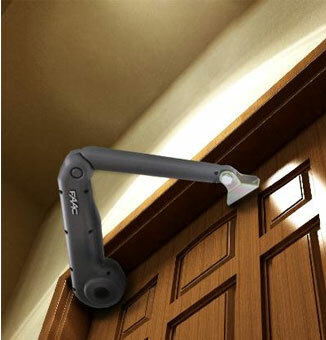 To rectify this problem, we have a gate opener that operates on an articulating arm (the first in the US), which works more like a human arm; it reaches around the corner of the column and pivots in 3 places: at the gate, the elbow and the base. This allows it to work on the most common column design of 24" with a gate mounted in the center. Safe, low voltage systems that can handle high traffic usage: Estate Swing introduced the first low voltage system with constant duty capacity to the US and continues to make these 24V low voltage systems with constant duty capacity. Low voltage systems have become a favorite of consumers around the country because they are safe to work on, they run off back up batteries in case of power less, and they cost less to operate. However, the biggest draw back has always been the fact that the battery is the main power source for the gate opener. The power is just there to trickle charge the battery. The trouble is that when the gate is using power faster than the rate of recharge (continuous, consecutive cycles), there will be a low voltage lockout, and the gate opener will not be able to operate until it is recharged again. Our 24V systems run directly off a transformer. This means the driveway gate can open and close it all day long, no recharge time is necessary. And these systems come with optional battery backup in case the power fails, so there is still the advantages of a low voltage system. Programming that reduces the hassle of installing a gate opener: The E-S Classics are Estate Swing's solution to problematic programming at installation. Many customers, professional or end users, have suffered through trying to program a gate opener to learn where to stop, start and slow down. The Classic series of automatic gate openers simplifies this process by making installation a basic process: get the gate opener mounted and powered and it is ready to run from limit to limit. Difficult programming can result in the risk of missing a cue and breaking a component or the hassle of reconfiguring settings again and again because of confusing multi-step directions. The E-S Classics circumvent all that. Unlimited long-distance communication between homeowner and the gate opener: Most wireless systems need to be within 500 feet of the gate, while wired systems or land-line telephone systems have a set range or cost a fortune to allow communications between the driveway gate and the house. 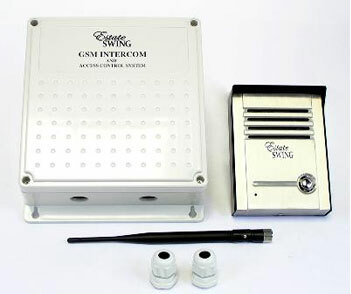 EstateSwing.com eliminates these problems with the very first GSM intercom in the US. The Estate Swing Unlimited Range Wireless Cellular GSM Intercom is the ultimate in versatility and convenience for remote operation of any gate opener. The range of this receiver is truly unlimited, so long as there is a cell tower available to receive and transmit the call. 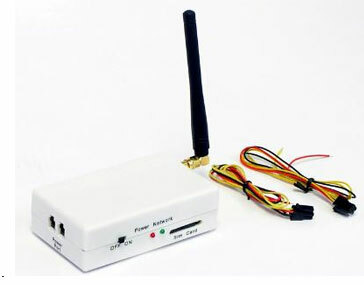 This is particularly beneficial in areas that have a great deal of interference for traditional radio transmitters and receivers, or for users who wish to open the gate from extended distances (such as from a home, cell phone, or even another state). Additionally, since it's a wireless communication system, it is unnecessary to run wires or a phone line to the house. The process of running wires can be time-consuming, complicated and expensive. The Estate Swing Cell Phone Access Receiver allows the user to avoid all that while providing a simple, secure, and convenient means of operating the gate opener. 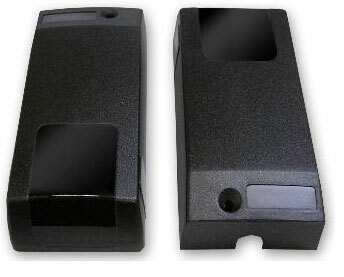 Remotes or proximity cards are no longer a cumbersome task to manage for large groups: With all gate opener systems, there must be a way for regular users to access the gate; the larger the group of regular users, the harder it is to keep track of remotes or access cards and it can be a hassle to punch an access code into a keypad. The Estate Swing Cell Phone Access Receiver is the ultimate in versatility and convenience for remote opening of any gate opener. This receiver totally eliminates the necessity of purchasing or carrying extra remotes because it provides access to the gate opener through an item most people already carry - a cell phone. Simply dial the receiver number and, through caller ID, the receiver will recognize the programmed number(s) and open the gate. This is more secure than traditional remotes because the number has to be programmed into the receiver to operate it, so there is less of a chance that unauthorized persons will be able to operate the gate. 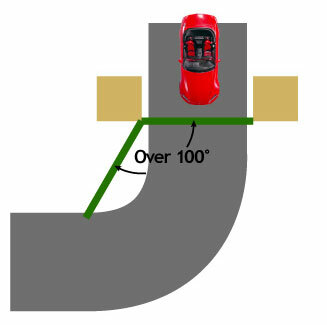 Gate openers that open more than 100 degrees to accommodate a curve in the driveway: Most gate openers have a very limited degree of opening. This is because the linear actuators have a fixed variable: the stroke length, which is the distance from the fully retracted position to the fully extended position. There are only so many inches the arm can retract to pull the gate open, which translates in a limit on the degree to which the gate can swing open. We have two solutions. The column mount operator can turn 120 degrees and the underground opener can turn 140 degrees or 180 degrees, depending on the purchased gear assembly. This will give you room to move the gate out of the path of the driveway and with 180 degree opening completely against the back of an adjacent wall. The convenience of automation, while maintaining an attractive entrance: Gate openers are machines, and machines for the most part are not designed for aesthetic appeal. Automatic gate openers pose an even bigger problem since they are not easily concealed. That is, until Estate Swing came out with a gate opener that is mounted entirely under the gate. The opener's motor sits in a foundation box below the gate and has a bracket that comes up along the bottom of the gate. Completely out of site, the underground electric gate opener is the definition of high end living. A transmitter/receiver photo eye (preferred for its reliability) that is wireless: Nothing is more tedious then running wire under the driveway. In the past, the only way to use a photo eye with a transmitter and receiver design (as opposed to reflective types which have reliability issues compared to transmitter/receiver styles) was with a wire to connect the two units. We were the first in the US to come out with a wireless connection between the two to enhance convenience and save time and money for installation. The convenience of a keypad that is sleek and attractive: Keypads have never been a thing of beauty, but they are a necessity. 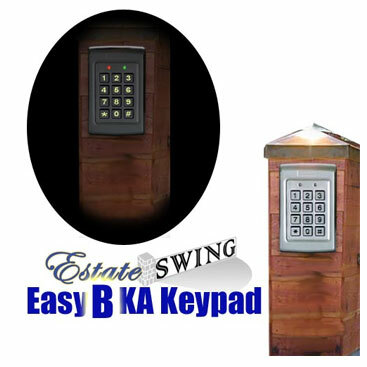 The Estate Swing EASY-KA Stainless Steel Keypad is a great gate opener accessory for those homeowners who want to have secured, yet stylish, gate access. The keypad is housed in an aluminum cast with a stainless steel finish to accentuate the style already associated with Estate Swing Gate Openers. 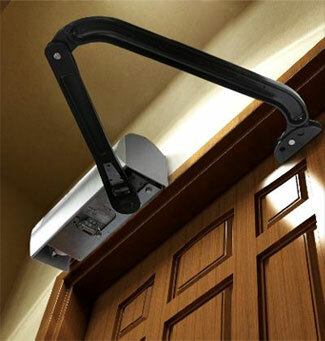 Automation options for carriage doors: EstateSwing.com has two openers, the first two on the market that will automate a carriage style garage door, Light Duty and Heavy Duty. Because carriage doors are so much like driveway gates, people have been contacting gate opener companies for solutions for automating them. However, no one ever made the alterations needed to actually perform the job correctly. 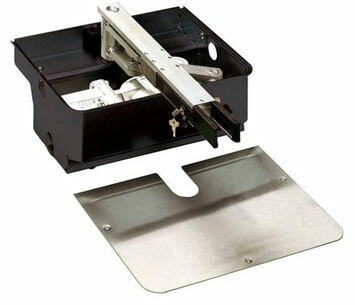 The opener needs to be on the inside of the structure with the ability to push the doors out; for linear actuators, this is not possible without taking up one to two feet of entryway space, which can create the impact hazards for vehicles. Additionally, heavy style doors posed safety risks because other gate openers do not have the appropriate safety features. We have developed two models and a specialized safety system just for automating carriage doors.